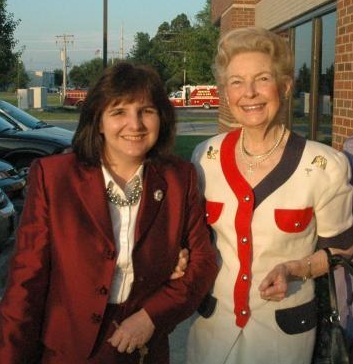 I am so grateful to have known Phyllis Schlafly. She was one of the few political activists who notices what people stand for and couldn’t’t be suckered by slick talk. She had a keen ability to sniff out truth and “say it like it is”. So many activists and lobbyists get caught up in the popularity contests and money contests they end up forgetting what path they were on when they started. The picture above was taken after our event, “A Conservative Roll Call”. It was a tremendous honor to have Phyllis come give the keynote speech and support me. I especially enjoyed our conversation in the car on the way there as we reflected on all the parallels in our lives. Phyllis is proof that one does not need to hold a public office to make a substantial difference in the political landscape. She received pressure from some, even within her organization, to support other candidates and causes. Yet she never wavered from taking principled stances and she fearlessly bucked trends, even when the momentum was swinging the wrong way. There are so few like her. To solve the problems our Country is facing involves far more than just finding another leader. She was a strong lady, but it behooves us all to have that kind of commitment within ourselves. We must learn from her, but not just the issues. We need to study the inner tenacity and courage she had to buck others, even fellow “Conservatives” when they are wrong. We may know of the battles she fought with those on the left, but she also fought many battles within the Republican Party on issues such as life, protecting the Constitution and protecting our borders. The principles she stood for transcend her life. At the same time that our leaders are dying off, many followers are dying off as well. The battle is not just economic. This is a battle for the soul of our Country. Will we have “the will” to pull ourselves back? Phyllis had great followers and was successful at articulating the vision. But it doesn’t have to die with her. 1.) 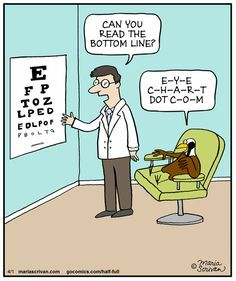 Do all you can, when you can, while you can. 2.) Stand with those who are right, even if they are the underdogs. 3.) Stand alone if you must. Others may come and join you. 4.) Shake off the insults from “the despicables” regardless of what party hosts them. Phyllis was mocked, ridiculed and insulted, yet she kept her poise, grace and dignity intact. May we be brave enough to stand strong and avail ourselves of more opportunities to offset those who don’t want to maintain a civil society. Come on folks! Let’s get up and keep going and keep the flame alive! It’s up to us now. Yes, we will go forward! 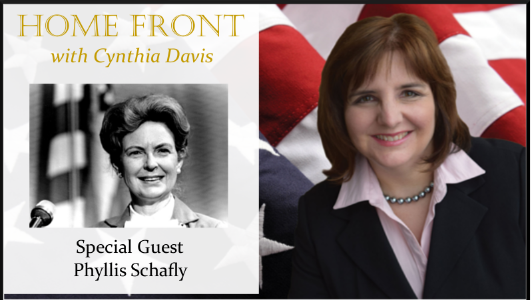 You will enjoy listening to the interview I did with Phyllis on our show, Home Front. She offers us a candid glimpse into her life and shares the hope that kept her going. Cynthia Davis, 1008 Highway K, O’Fallon, MO 63366. You can also contribute online here. I always had great respect for Mrs. Schlafy. I have enjoyed this reporting of your fondest memories. What I find to be so sad is that I just heard the most horrible insult for Mrs. Schlafy over call-in radio. Disgraceful. I’m saddened by her passing. Thank God for Phyllis who taught us so well.